Nanking Cherry is a broad, spreading shrub. It is grown primarily for its showy white flowers which cover the plant in early spring. The flowers are borne sessile along the stem. The 1/2″ bright red fruit which ripen in early July are edible but a little tart for fresh eating. They make excellent jams and jellies. The pit is quite large in relationship to the fruit size. The fruit is relished by birds. Foliage is very attractive, dark green with fuzzy undersides; turning yellow in the fall. The plant works well as a mass planting or informal hedge. 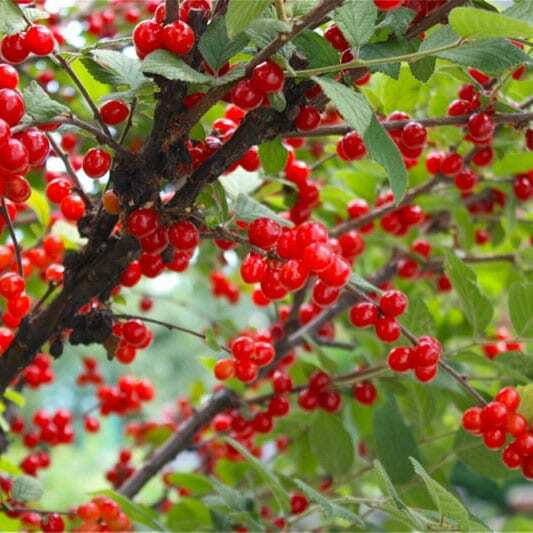 Nanking Cherry is native to northern China and is very winter hardy.